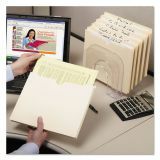 Great way to transport files out of the office. 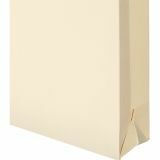 Closed sides keep papers secure. 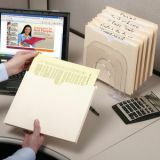 Thumb cut for easy access to documents. Back tab is 1/2" higher than front for indexing. 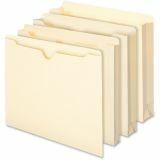 Note: A minimum quantity of 4 must be ordered, and in units of 4 thereafter. 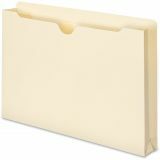 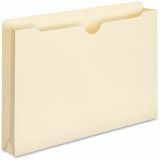 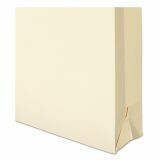 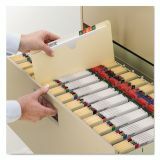 Smead Manila File Jackets, 2-Ply Top, 1 1/2" Exp, Legal, 11 Point, Manila, 50/Box - Manila file jackets feature full-height gussets to keep materials from slipping out. 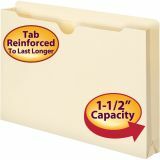 The 1/2 high, two-ply reinforced, straight-cut tab with thumb-cut design allows easy access. 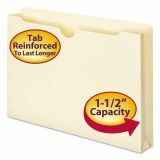 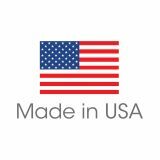 Legal-size file jackets expand 1-1/2" and are made of 11 point stock."